If you could spend a day with Rabbi Abraham J. Twerski M.D., and ask about every problem that plagues you, your friends, or your family - wouldn’t you take that opportunity? It wouldn't matter if your questions were about "small" things that fray your nerves daily or about larger, life-changing struggles. He would listen patiently, carefully consider your situation, and help you build a bridge over your predicament. Even better — how to make your predicament disappear! You deserve the peace of mind Dear Rabbi, Dear Doctor can bring. 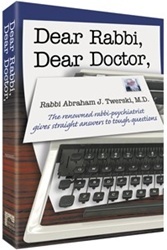 Rabbi Twerski's advice is always down-to-earth, rooted in Torah and drawn from his long experience as a nationally known mental health professional. He believes that every individual and every family is entitled to a happy, healthy outlook. As he says in his introduction, "A Jewish home should be an oasis of stability, decency, and righteousness in a toxic world." This book is an important step in that direction. 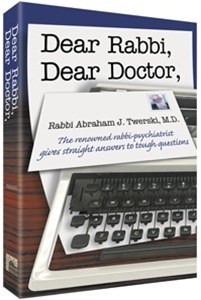 Thousands of people rushed to get copies of Rabbi Abraham Twerksi's thought-provoking answers to a host of common questions in the first volume of Dear Rabbi, Dear Doctor. These short responses, most of which were based on his successful column "Seeking Solutions", have been featured weekly in Hamodia. Rabbi Twerski approaches readers' perplexities multi-dimensionally. As a rabbi, he understands their spiritual aspirations and seeks to connect them to Torah-based solutions. As a psychiatrist and addictions specialist, he understands the human capacity for misperception and self-deception and helps the reader achieve clarity about the real issues which often masquerade behind the "presenting problem". As a descendant of an illustrious Chassidic dynasty, he flavors his answers with the intergenerational wisdom of sages who have guided, inspired and helped people for centuries. "In seeking a solution, the first and most important point is to clarify the problem. This often suffices to arrive at a solution. ... [My] responses to queries are generally geared toward helping a person look at the problem from a different perspective."